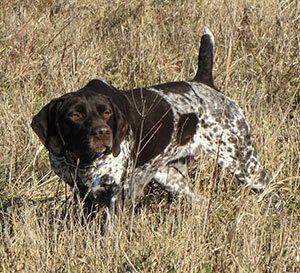 Jet is really what we have targeted in our breedings at Shooter's. She is one of the easiest dogs to live with. 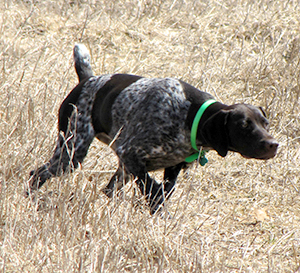 Her hunting abilities are second nature; a true hunting companion. 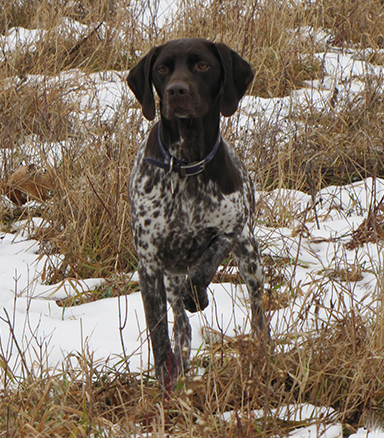 She's a medium ranging dog that is just extremely dependable in finding birds, holding her very stylish points and delivering the cripples that came down well out of sight. Her training consisted of giving her some guidance of what we wanted and she has always done her best to complete those tasks. In the home, Jet is as low maintenance as they come. She takes after her Mom in those regards and half the time we have to look around to make sure she's here. She's good with other dogs and welcomes visitors without hesitation. Jet is an AKC Champion and Master Hunter. 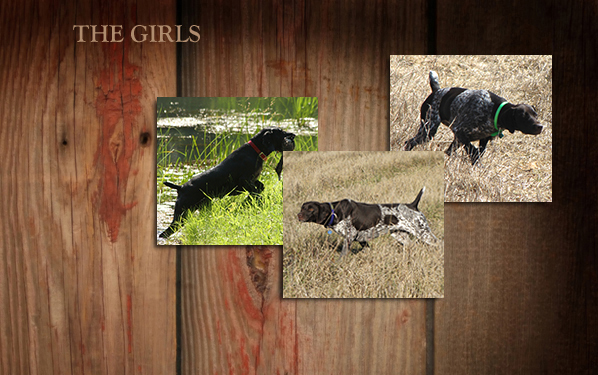 She's had 2 litters, both times producing some really special pups, both in the home and field. 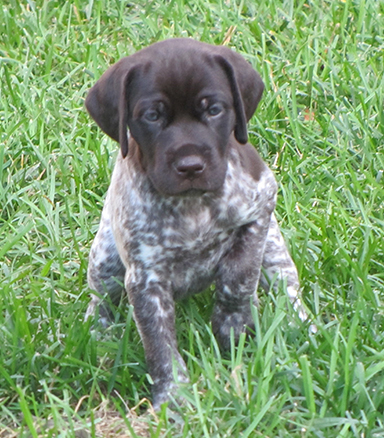 We have her 3rd and final breeding planned for this spring (2014); more details are available on our Upcoming Litters page. Jazz; she is a great combination of strong desire and cooperation. She’s so willing to learn and does her best to please. Jazz earned her prize 1 Natural Ability title at 10 months of age. While working to get her ready for the NA test it was obvious she was capable and ready for more. At 13 months we she ran her first Utility test. Since the 3 months in between tests was more her showing us what she could do rather than us training her, we refer to the utility test as “her” natural ability test. She missed a prize 1 by one event but we were thrilled with her qualifying prize 3. 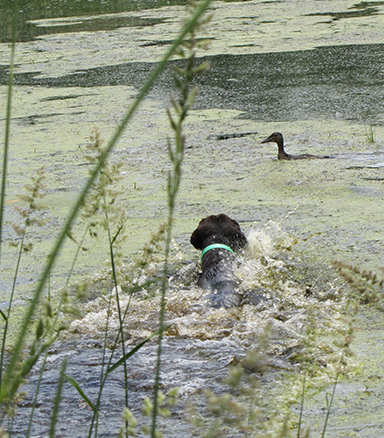 From there it was on to her first hunting season; Jazz once again amazed us with her performances. 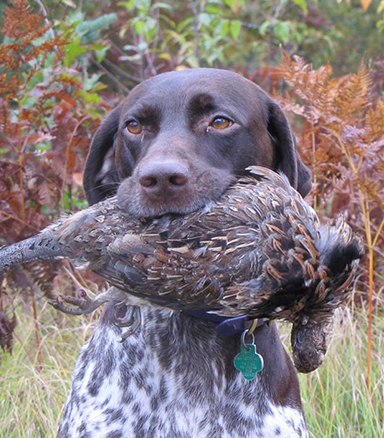 Her first year of Grouse hunting (2013) Pete shot 6 pointed grouse and scads of woodcock over her, most of them were retrieved. 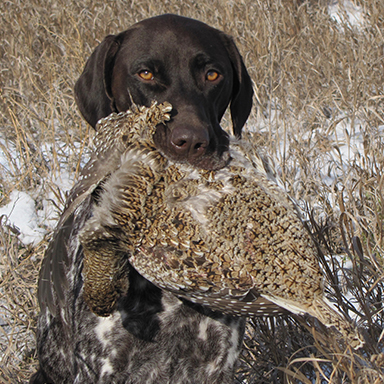 We finished up the year with a trip to South Dakota for some wild pheasants. We continually recognize Jazzy’s nice combination of ability, cooperation and her overall puppy goofiness. Now here it is a year later (2014); Jazz is 2, she has her Utility Prize 1 and will be going to the Invitational next year. We’re excited to get her back in the woods of Northern Michigan watching her do what she loves most …...she’s our very special Shooter’s Limited Edition; aka Jazz, aka Jazzy; aka Spazz….our little girls growing up and still amazing us every day.